Rachel Thelen is immersed in a world very different from the northern Minnesota town of Park Rapids where she grew up. The 2013 St. Scholastica graduate is serving at a tuition-free Catholic boarding school outside of Port-au-Prince, Haiti, whose students come from some of the poorest neighborhoods in the impoverished nation. Thelen teaches geometry, English, gym and computer courses to middle- and high school students at Louverture Cleary School (LCS). LCS is supported by The Haitian Project, a non-profit Catholic mission that began the school as a response to the country's critical need for education. Nearly 60 percent of the Haitian population lacks basic reading and writing skills and more than one million primary school-age children never go on to middle school. LCS offers free Catholic education and formation to 360 students. 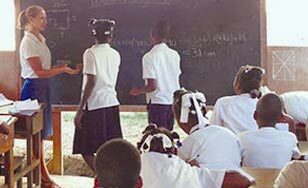 Haitian faculty teach most classes, but each year eight to 12 volunteers such as Thelen commit to living, teaching, and working at LCS for one year. The volunteers serve as living witnesses to the Gospel-based motto of The Haitian Project: "What you receive for free, you must give for free." "Rachel's work ethic is an inspiration," said Deacon Patrick Moynihan, president of The Haitian Project. "She is as far beyond her age in wisdom as she is in toughness." Thelen always knew she'd take the non-traditional route after graduation. "I wanted to give back all the gifts I had been given," she said, "but also to give what was needed. Education is a gift that many take for granted, but can open so many doors." She has overcome language barriers and learning to instruct without the conveniences of Smart Boards or even pre-printed worksheets. Louverture Cleary students excel. They graduate with fluency in four languages: Kreyòl, French, English and Spanish. The pass rate of the national exam that qualifies them to attend a university is 98 percent. Some of St. Scholastica's very own Benedictine values are evident on the campus of LCS, Thelen said. While the students spend their mornings in class time, and evenings studying, they take an hour out of their afternoon to clean the campus grounds - a lesson in stewardship and community that benefits not just each individual student, but improves their neighborhood and their country. "In the United States we are so encouraged to improve our own individual lives and get ahead," Thelen said, "but our students (at LCS) know that they must give back their gifts to improve the society around them." Visit haitianproject.org for more information about Louverture Cleary School and The Haitian Project.